A) Why doesn't it work? In this article, I will try to be as clear as possible, and make things understandable for everybody. But first, let's recap a few basics. I) What's a competency model? A competency is an ability to do something. A competency model is an attempt to describe the needed abilities to do something (a job). II) What's the interest of a competency model? The interest is to produce a model that includes all the abilities needed to do something (a job). So that, we can know what is required, what is needed. There is an attempt to predict the future. And more precisely to predict future job performance. III) Since when does it exist? Nobody really knows, because we can fairly suppose people for centuries had some ideas about what's needed to do something. And quite probably they were not always very accurate, but we can presume there were attempts. It's in 1973 that McClelland wrote in the American Psychologist, arguing that traditional academic exams and IQ tests were ineffective measures for predicting effective job performance. As an alternative, he proposed that organizations should assess the underlying characteristics of an individual such as motives, traits, skills, and knowledge to determine job success. IV) Why does everybody use competency models? And when you have a guide, you don't need anymore to think ... about it. That's the whole interest of having a process. When you think about it, every industry, small, medium, large have processes to produce things. And that's because they have processes that they don't need to "reinvent the wheel" every day. It saves time, energy and resources. It makes things simpler, it standardizes outcomes. It makes things predictable. And everybody likes what's predictable and it pushes away the specter of our fear of uncertainty. V) So, why does it fail if it has so many advantages? 1) IT'S A MODEL, aka an attempt to reflect reality. IF YOU DON'T ASSESS REALITY WELL, THEN YOUR MODEL IS BIASED. BOOM! 2) Lot's of models are filled with jargon that only professionals understand. But every professional does not understand the same thing because... there are often definition confusion or no definition at all. Also, managers (from other professional fields) are supposed to use them, at least from time to time. No definition = confusion again. 3) Some models come from academic, are theoretical, and often as filled with as many variables as possible to reflect reality. But the ones who are really using them don't always have the time to sort through all the items. 4) Sometimes all the items are ranked or visually presented as equal. But things are rarely 100% equal all the time! 5) Dependence on old competency models. "The greatest danger in times of turbulence is not the turbulence, it is to act with yesterday's logic." The same holds true for competencies. 6) The same model again and again. Like if every organization, companies were exactly the same, doing the same things, the same way, at the same level of development. Like if to be successful in one job, in one organization would be the same everywhere else! And this one is particularly redundant. Most people make the false assumption that if they/someone were/has been successful before in a particular job, they would be successful at the same job/job title somewhere else. This gravely diminishes the impact of success factors. Success factors are of 2 different natures: intrinsic ones and extrinsic ones. 10) A tendency to pass people through a grid: either they move on through or you stop them. Kind of a binary view of the world! 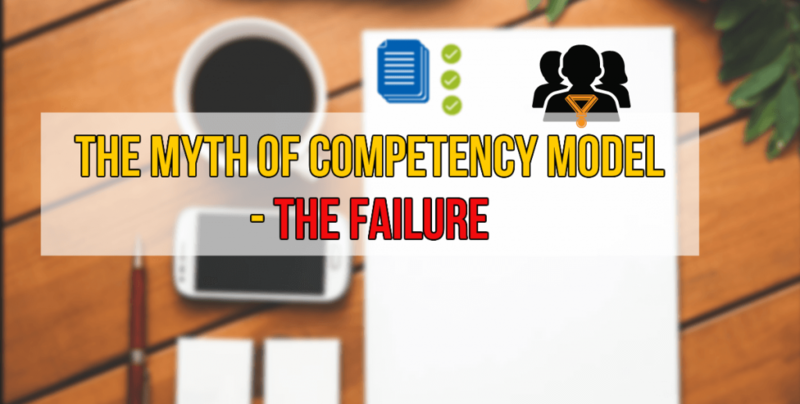 B) Now, let's imagine you have a competency model that is fine for you. I) Then now you got a problem: HOW TO IDENTIFY THOSE "COMPETENCIES"? If it's about knowledge. I guess it's quite easy to find out...in a lot of cases. you can't know what a person really knows, and how this "extra" knowledge can be useful to find out creative ways of solving problems. If it's about management and leadership abilities, then it becomes quite difficult, because we are then dealing with more abstract things. So, how do you assess these abstract things and which one is really useful? II) Any simple answer? Use some kind of psychometric assessment! Well, you must know that psychometric tests are not made all equal! And even far from that! I don't pretend to know all of them, but I've studied the field. I can tell you that at the end of 2012, I've been consulted by a well known psychometric test company to provide feedback on their different assessments. Their so-called general culture assessment was pure garbage. Absolutely no use. General culture itself is a concept that is far from being well-defined. Their "motivation" assessment wasn't really much useful, for business purpose. I reviewed their reasoning abilities assessment, their "highest" assessment and you know what? Even according to them, people with Master degree, MBA or higher usually rank lower than people who don't have. 1) people with Master degree and higher have lower abstract reasoning abilities in general than others. And so why bothering paying and following a Master, an MBA or a Ph.D. if you don't acquire any more abstract abilities? Professor of universities will love it! 2) their assessment just did not work to fulfill their purpose. There is still a lot to say about assessments but that's not really the purpose of this article. THE WAY THE ASSESSMENT IS DESIGNED CONDITION THE RESULTS, AND THE USEFULNESS OF THESE RESULTS. C) Another layer and a major one: the ORGANIZATIONAL LEADERSHIP layer! I think that almost everybody will agree with me that we are living in a time where changes, turbulences are if not constant, at least appear more and more quickly. So, the use of the "right" competency model may not be much of use if you try to solve a present problem. Because your present "human" solution is the solution of a problem of the past. And can you be sure that this "human" solution will not be defeated by the next turbulence? What I mean is that a competency model is a tool. Like all tools they are useful but "limited" solutions. They are limited because tools are only able to help you achieve what you've decided to achieve. If you don't know what you want to achieve, then tools won't make it for you. So if an organization lacks leadership, of vision for the future of what they want to achieve, of what success is, and so on... there's inevitably a lack of coherence and alignment along the way. Without proper Leadership, even the best competency model and the best people won't make the deal. if... well ... a lot of other things could be here, but I stop with 3. I help individuals and organizations to shorten their (expat career, business) transition periods, by providing Strategic Decision-Making Guidance that declines in a wide variety of applications. I bring a holistic approach to organizational, internationalization and expatriation issues that most of the time starts with a "people first" mindset. Challenging status quo, allowing others to be creative, looking at what other usually don't see are "my appetizers".